Israel's future in world soccer will be decided; pro Palestinians storm hall, throw red cards at Israeli delegation; reports of bomb scare. Palestinian Football Association President Jibril Rajoub is submitting an amendment to the PFA's proposal to ban Israel from FIFA, minutes ahead of the vote itself. The vote was not expected to reach the required majority. Rajoub said he wanted to find a "responsible solution" to the issue, as opposed to "scoring points." Insisting he thinks "it is right" to ban Israel, Rajoub added that "a lot of colleagues" had expressed "how painful it is for them to hear, in this (football) family, to hear the issue of suspension." "The said to me... we don't want to have the precedent of suspending" a country, he said, but added: "That does not mean I give up the right of resistance" in other ways. Specifically, he demanded three votes: to form a committee to ensure Israel lift restrictions on Palestinian footballers' "freedom of movement," on "stopping racism" in football, and whether "the issue" of Israeli teams based in Judea and Samaria "go to the UN." "Are these territories Israeli? If they are, they have the right to play football and enjoy the game. But if not, these clubs... should be banned." A relieved FIFA President Sepp Blatter hailed the decision to drop the proposal to ban Israel as "a great moment." The Israeli Football Association Chairman Ofer Eini addressed the congress, saying he would not "point fingers" in response to the PFA's move and instead urging the PFA to "leave politics to the politicians... and to the best for football on both sides." Eini proposed a joint Israeli-Palestinian-FIFA committee to resolve problems between the sides, and called on the sides to "embrace" and overcome differences. However, he highlighted his one disagreement with Rajoub, saying he opposed "setting a precedent" by referring the issue of the five Israeli teams to the UN. "Most of these teams are youth teams - do we really want to prevent children from playing?" He then called on Rajoub to go up to the podium to shake his hand - a gesture Rajoub refused. 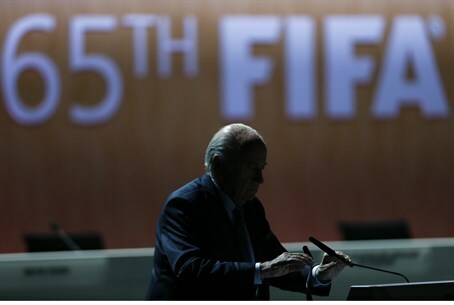 Several minutes of controversy ensued after Blatter moved to strike the motion requiring UN intervention. The amendments passed by 90% of votes. Earlier, the 2:30 pm return, as well as the actual vote, was temporarily halted by a bomb scare at the FIFA Congress voting hall. "We can confirm the receipt of a bomb threat," Zurich police have announced, according to the Independent. Several reports, including in some Israeli media outlets and RT, have stated that journalists were forced to leave the hall and that everyone has been evacuated; this remains unconfirmed. FIFA Secretary-General Jerome Valcke announced at 2:40 pm that local authorities visited during the lunch break to evaluate the "anonymous threat" and that the premises have been cleared. Meanwhile, search dogs are scouring the area, according to Eurosport. The 65th annual FIFA Congress met in Switzerland Friday, and will decide, among other issues, whether to heed the Palestinian Authority's (PA) intransigent demands to oust Israel from world soccer over security issues. The PA, which has been a FIFA member since 1998, wants the governing body to expel Israel over its restrictions on the movement of Palestinian Arab players - the same restrictions imposed on all PA residents so as to combat the terror threats. The vote needs a two thirds majority of the 209 members to succeed, or 156 votes; all 209 are currently present at the Congress. As of 11:22am IST, the agenda over the PA bid has been presented; 99% voted to proceed. During the proceedings, a group of pro-Palestinian activists broke into the hall, shouting "boycott Israel, stop apartheid, Red Card to FIFA." They were removed from the hall after throwing red cards at the Israeli delegation. After several speeches, the official debate on Israel began at about 2:45 pm local time, with a presentation on FIFA's general anti-racism taskforce, which includes surveillance systems and monitoring to check whether events or teams are 'at risk' of racism. The taskforce has at least partially implemented this program and that there is a "zero tolerance policy toward racism." Blatter then used the presentation to segue to the Israel-PA issue, claiming it is national soccer organization's responsibility to fight racism within its bounds, and noting that violators are subject to disciplinary committees and sanctions. Blatter continued to say that imposing financial sanctions are "not enough" and that punishing whole teams is more effective, in his view. Blatter noted in his address that the organization is facing "trying times," perhaps talking about the corruption scandal which erupted separate to the controversial Palestinian Arab vote earlier this week. Blatter called to "try to lift our spirits" and not to "let the reputation of FIFA and football be dragged through the mud." He also justified that the organization "cannot constantly monitor" everyone in world soccer, some 1.6 billion people. "Outside the pitches, there are no limits," he claimed. "There are no time limits and no referees." Blatter's comments beg the question of whether the organization could meddle into international affairs in general, hours before the precedent-setting vote. Prime Minister Binyamin Netanyahu, Opposition leader Yitzhak Herzog (Labor), and Yesh Atid Chairman Yair Lapid have each spoken strongly against the vote over the past 24 hours, warning that such a vote would set a precedent for the sports organization to make decisions based on global politics and regional security issues. Critics have noted that FIFA is hosting the 2022 World Cup in Qatar in December of that year, despite its numerous human rights violations and a host of security issues for all players involved; it also has not intervened in the soccer potential for other human rights violators, such as Saudi Arabia or Iran.